Vacuoles are the compartments within the protoplast bounded by the membrane tonoplast containing sap (aqueous solution). Vacuoles are present in both plant and animal cells. Both they are most abundant in plant cell. 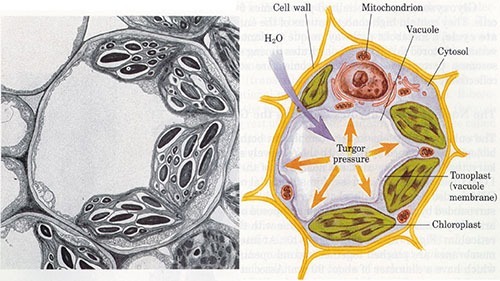 In plants, they occupy major part of the cell. Thus, the remaining intracellular structures form a thin peripheral layer. The numbers of the vacuoles are different types of cells. They occupy 90% space of cell in parenchymatous cell. But large vacuole is absent in meristematic cells. These cells contain a large number of smaller vacuoles. The vacuoles are bound by single membrane. It has thickness like plasma membrane. But membrane of vacuoles has ability to absorb substance by active transport. They are formed by the fusion of small vacuoles during plant growth and development. Vacuoles are formed by endoplasmic reticulum and dictyosomes. Endoplasmic reticulum forms protein part of the membrane of vacuole. These proteins are transferred to dictyosomes by transport vesicles. Vacuoles are budded off from the surface of dictyosomes as small vesicles. Different vacuoles have different contents its sap. Most part of vacuoles are occupied by water. All other contents are dissolve in it. The solutes are K+, Na+, Ca+, PO-4, SO-4, Ca+2. The sap of vacuoles also contains sucrose, glucose, organic acids, phenolic compounds like tannins and nitrogenous compounds like amino acids, peptides, proteins etc. They expand the plant cells and do not dilute its cytoplasm. They store water, cell products or metabolic intermediates. It also stores food reserves like protein, flavonoids and alkaloids. The vacuoles also contain pigments. Any of three distinct classes (peroxisomes, Glyoxisomes and Micro-Peroxisomes) of cytoplasmic organelles that are bounded by a single membrane and contain a variety of enzymes is called microbody.